The ET-72 is easily one of the most playable seven-strings we've ever wrapped our hands around, made more versatile thanks to the Floyd. First-class playability. Tuning stability. A cracking line-up of tones. Erm, more finish options would have been cool, but that's it. While British guitar maker Manson has had its reputation boosted in recent years thanks to its association with Muse guitarist Matt Bellamy, its latest models are designed to put a smile on the chops of practitioners of something called 'djent'. Even some people who actually know what djent is supposed to be don't believe it exists, you know, like the Loch Ness monster... or a funny Michael McIntyre routine. "As is the case with Manson's well-regarded MA Series guitars, the construction and finishing of the bodies and necks of the E-Series is carried out in the Czech Republic"
Into this theatre of genre conflict strides our newly arrived E-Series Manson guitar: the seven-string ET-72. The example that you can see in the pretty pictures on this page is the first prototype production model. By the time you get your hands on one, the tuner buttons will be smaller to suit the Lilliputian scale of the headstock, and the MBK-3 (aka Manson Bare Knuckle) bridge pickups will be etched with the Manson logo. In all other respects, however, it is exactly as it will be in full production guise. As is the case with Manson's well-regarded MA Series guitars, the construction and finishing of the bodies and necks of the E-Series is carried out in the Czech Republic. The final assembly, including fitting the pickups, the wiring and the setup, is handled at Manson Guitar Works in the UK. 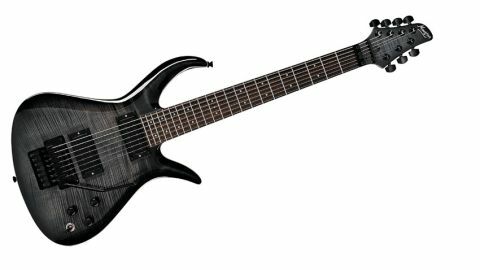 Seven-string options include the ET-71 with your choice of Seymour Duncan or active EMG pickups at £1,999, or our review ET-72 and its MBK-packed engine bay for £2,299. The ET-72 also comes with upgraded CTS potentiometers and Sprague Orange Drop capacitors. All models are shipped with a custom Hiscox LiteFlite case. "You've got to love those beefy-sounding bottom string riffs. We also like the fact that even vigorous whammy bar abuse couldn't knock the tuning out"
The construction of this seven-string E-Series variant is essentially the same as it's six-string brethren, the E-62: five-piece neck, mahogany body wings and a neck-through-body construction. The big difference, though, is the genuine Floyd Rose double-locking vibrato with matching top nut. The neck profile of the ET-72 (in terms of depth at least) is slim - but not so much that it will totally alienate chubby chasers. In other words, it comfortably fills your palm. Of course, the rosewood fingerboard is wider than your average neck to accommodate an extra string, but it only took us a brief period to come to terms with that additional timber. Our ET-72 was supplied with its fattest string tuned to a B. You may wish to experiment with the tuning, but the low B works great for us. You've got to love those beefy-sounding bottom string riffs. We also like the fact that even vigorous whammy bar abuse couldn't knock the tuning out. As previously mentioned, Manson has collaborated with Brit pickup guru Tim Mills, the grand fromage at Bare Knuckle, on the MBK-3 humbuckers fitted to the E-Series guitars. As the name suggests, this is the third time these guys have pooled their resources, having previously worked on pickups for Manson endorsee Matt Bellamy. "The boys at Manson's wanted to expand their range of MBK pickups," Tim tells us over the phone. "I suggested moving towards a ceramic-based set because the others we'd done up to that point had been Alnico V-based. With the popularity of djent, progressive rock and metal styles, it seemed an obvious direction to take. "They were keen to develop an extension of the range rather than go completely leftfield with it," he continues, "so I kept the voicing on the classic side, but went for a lot more aggression, particularly in the midrange, as well as a lot more power - which comes care of three very large ceramic magnets in the bridge [pickup]." As it was, Tim elected to stick with Alnico V magnets in the neck unit: "I wanted to maintain versatility, not only for a really fat, fluid lead tone, but also for more tonal colour when run clean," he explains. "This also produces a unique mid-position tone with both pickups on, which I also really like because there's a genuine 'third' tone, as opposed to a variation of bridge or neck. The twin hex-bolt pole-piece design helps produce a little more bottom end and also adds a more contemporary look, which is something the Manson team were keen on." All that translates to a pair of pickups that can pull off razor- sharp chugging rhythm and flab-free bottom string riffs, yet clean up for convincing neck- pickup jazz tones, making the ET-72 less like a genre-specific metal machine and more like a great all-rounder. "A lot a thought has gone into this beautiful Manson guitar. Bringing Tim Mills at Bare Knuckle onboard to fine-tune the tonal output is proof of that." Tim Mills has a knack of making passive pickups with the power and clarity of active units without compromising warmth on clean settings. That beautifully executed tonal balance sums up the quality of this wonderful guitar. A lot a thought has gone into this beautiful Manson guitar. Bringing Tim Mills at Bare Knuckle onboard to fine-tune the tonal output is proof of that. Okay, we'd be lying if we said we totally 'get' djent. But while the genre squabbles elude us, we do understand the desire to hone the bottom-end response of a heavily distorted, humbucker-loaded electric - and that's where these guys have hit pay dirt. The E-series offers a great balance of clean and distorted tones with much of the flabbiness of traditional twin- 'bucker electrics obliterated. The E-72 is supremely executed. Whoever is building and finishing the bodies and necks over in the Czech Republic definitely deserved their Christmas bonus this year, and the finishing touches performed at Manson make it just that bit easier to justify parting with the business end of two grand. While most of the rest of the guitar world obsesses with looking back, here's something that's all about right now.